“PBT” stands for “preliminary breath test.” I don’t know how people speak of it outside the Metropolitan Detroit area, but in Macomb DUI cases, Oakland DUI cases and Detroit OWI cases, people often use the term “PBT” as an acronym for “portable breath test.” While this is not technically correct, it does accurately reflect that the machine used for a “PBT” is small and portable. And while we’re clarifying things, it should be noted that in Michigan, there is no charge of “DUI,” meaning “driving under the influence.” Michigan law only makes out the charge of “OWI” (check your ticket or court notice), meaning, “operating while intoxicated.” As much as “DUI” has come to be synonymous with “drunk driving,” the term “PBT” has likewise simply come to mean the breath test given by a police officer with the handheld portable unit. Rather than stand on ceremony here, we’ll just use the term as everyone understands it. A discussion like this can sound rather well organized and clinical, but at the time a PBT unit with a straw is being shoved into your face, you’re probably not thinking about the device’s technical name or evidentiary limitations. If anything, you’re probably just praying in your head some version of, “please let me blow under the limit!” Whatever else, if you’re reading this, that didn’t happen. Nor would it be fair, really, to expect any kind of “divine” intervention that would thwart the proper functioning of such an instrument and let a person who is over the limit somehow test out as being under. The machine did its job, the night took a turn for the worse, and now you’re dealing with a DUI. Earlier, we noted that the acronym “PBT” stands for “preliminary breath test.” Key here is the word “preliminary.” These portable machines are, by and large, reasonably accurate, but not accurate enough to provide bodily alcohol content (BAC) scores sufficiently reliable to be used against you in court. This goes to one of the more common misconceptions about PBT scores. In those cases where someone remembers what he or she blew in the back of the police car, it is not unusual for him or her to think that the number is part of the DUI charge. It’s not. 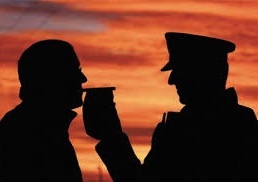 A PBT score is only used as part of the determination that there is “probable cause” to arrest you and take you to the station, where you’ll be asked to perform the real breath test on the big machine. There is a lot of science involved in a breath test and the machine used at the police station. Some people are willing to spend the money to challenge those test results. Yet for all that effort and expense, of all the people arrested for a DUI each year, less than .25% (meaning less than one-quarter of one percent) of them are ever found “not guilty” after spending a boatload of money on a drunk driving trial. In 2011, for example, about .17% of all DUI arrests in the State of Michigan resulted in a “not guilty” verdict. Whatever else, technical arguments about the scientific unreliability of breath testing doesn’t sell particularly well with juries. Here, however, we’re not focused on the science of breath testing at the police station, but rather the role of the handheld preliminary breath test. In that regard, the biggest value of the PBT given at the time of your arrest is to determine, at least preliminarily, if you are over the limit and should be taken to the police station for further testing. From the point of view of a Detroit DUI lawyer, like me, the results of your PBT test also provide a benchmark from which to interpret your BAC scores obtained from the from machine at the station. In other words, if your roadside PBT score was .14, and you blow .06 at the station, or, conversely, if you blew .06 on the road, and then .14 at the station, something is likely wrong, and serious investigation is needed. Most of the time, a person’s PBT score will be at least relatively close to his or her BAC score from the police station. Any difference or similarity has to do with how much alcohol the person consume, exactly when, and how his or her body metabolizes it. Thus, if Dan the driver slams 2 quick shots before leaving the bar and gets pulled over just as he leaves, his roadside PBT score may not reflect those last 2 drinks. By the time he gets to the station, however, his BAC will likely have increased significantly. The larger point here is that the PBT test is not “the” test used against you in a DUI case. In fact, the BAC score is only admissible in a DUI trial for a few, very selected reasons, none of which is to prove that the PBT result was your actual BAC when you were driving. If there’s a takeaway here, it’s that you likely shouldn’t get all excited about your PBT score, unless it was really low (.02 to .05) or the difference between it and your actual BAC scores from the police station is significant (.04 or greater). These are not hard and fast numbers, but in any case where variations of this magnitude are present, a DUI lawyer will likely be undertaking a painstakingly thorough investigation. As we’ve clarified, “PBT” means “preliminary breath test,” not “portable breath test.” We’ve also seen that, in the larger picture, that technical clarification really doesn’t change the purpose, role or value of the PBT. Finally, we’ve noted that the PBT has a specific, although limited and often confusing evidentiary value. In the final analysis, the PBT is really a kind of mechanical “smell test” that plays an important, if not misunderstood role in a DUI case.